There are clips in EoE that look like this. I wonder where these clips come from. What are they watching/listening to? 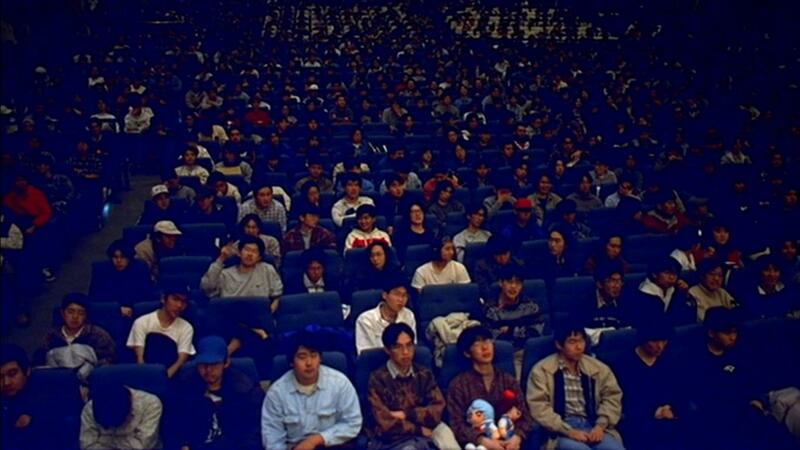 The theater is a shot from one of the screenings of Death and Rebirth. I vaguely recall someone somewhere identifying which theater it was, but I can't find the post. This was part of an entire sequence of live-action shots near the end of the instrumentality portion of "End of Evangelion", the panning shot of the inside of the theater is both kind of a 4th wall as well as fitting in with the motif of the theater within instrumentality. Recall also from the last two episodes of the TV Series where instrumentality is heavily depicted as part of a theatrical set, like on a stage. Likewise, in EoE, we have a few shots, including a sequence in a sandbox, where there are those folding chairs seen from the end of the TV series. Another related note is that the "Death Threats" sequence during a similar live-action portion of instrumentality has some of the letters mention seeing Death and Rebirth at the theater. Partial answer: the footage was shot at Shinjuku Milanoza, a cinema hall. In this video, you can hear the establishment's proprietor speaking prior to a screening of End of Evangelion (one of the last screenings at the hall before it closed in 2014) and mentioning this. This detail is apparently well-known among Japanese Evangelion fans. According to ANN, the hall was credited as a collaborator on End of Evangelion. I was unable to find information on what, specifically, the audience was watching when this footage was taken, but it's presumably some movie that was in Japanese theaters in 1996 or 1997. What's with the taped over speech-bubbles in the preview? Evangelion - What happened to the humans in space/astronauts during the 3rd impact?